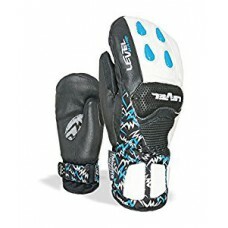 The Level Worldcup CF JR glove is a Junior's racing glove that models the full scale adult version. With added knuckle protection and reinforced leather, these glove can handle the high impact beating that many race gloves take. Thinsulate insulation will keep your little racer's hands nice and warm while a short cuff with adjustable strap keeps snow and ice out. Level's own Custom Fit technology, a heat based molding system, allows for the best possible performance.